This year, I didn’t buy a thing on black Friday or cyber Monday. Nothing. Nunca. Nada. This is actually kind of unheard of for me, especially given the fact that I’m such a technology buff. Cyber Monday has actually been my favorite self-gifting holiday of the year. Why the change this year? I think a big part of the reason is the so many of the items offered for sale I already have. 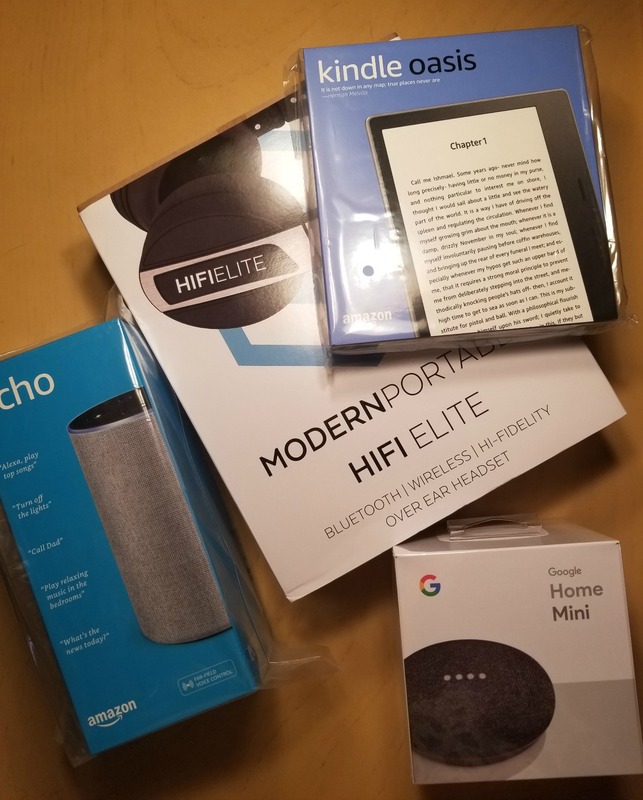 I’ve already bought Echos, Echo Shows, Echo Dots, Kindle Paperwhites, a Kindle Oasis, Fire tablets, Fire TV sticks, etcetera. The picture in this post is just a few of the items that I already have (yes, there are more that arrived after I took that picture) and am currently testing to review. Don’t get me wrong, some of the prices that these items have been offered at makes me wish that I hadn’t just recently bought them. But it’s really hard to get excited about bargains for things you already qwn. How about you? Did this year’s cyber bargains interest you? This entry was posted in Musings and tagged Black Friday, Cyber Monday, deals, online shopping. Bookmark the permalink. ← Third-party covers for the Kindle Oasis are here! We weren’t really tempted by the deals this year, even though we own none of those shiny things you shared. Would have been nice to see some decent airline discounts. Oh, we did get some half-price tickets to a Suns game, so yeah, there was that! I think we’re in ‘experiences, not stuff’ mode in this house.